It doesn’t seem to be as common nowadays as when I grew up quite some time years ago, but a horseshoe has always been a symbol of good Luck. When you do see it the horseshoe is usually hung over a doorway. Most of the time the horseshoe is seen in an upright position, said to collect good luck, or to keep luck from falling out. However, even with its prongs down it is a symbol of good luck. If you find an old horseshoe it is lucky. The number of nails you find in a horseshoe indicates the years of good luck. To dream of a horseshoe is a sign you will receive unexpected money. To find a horseshoe with the open prongs toward you means all your troubles are over – it is very lucky. 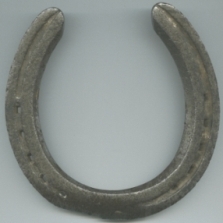 The many traditions behind the horseshoe >superstitions all seem to be related to other symbols that deal with the solar circle, the half-circle, the half-circle, or the crescent, and the crotch of the human body. The half-circle, U-symbol, or crescent composed of a pair of horns was sometimes used as a symbol of fertility. It was supposed to attract good fortune and repel evil. Sometimes the prongs were down to which represented the seat of feminine powers. Sometimes they were up to represent masculine powers. Whichever way they were used it always represented a potent and protective symbol. It is said that the Greeks originated the horseshoe in the 4th Century to protect the feet of their horses. At times the horse has been considered a sacred animal. All the way up until recently a horseshoe was made with seven holes for nails, four on the inside and three on the outside. The lucky number seven, combined with a crescent symbol added to the potency of the talisman. The Romans and Greeks nailed horseshoes to their walls to protect against the plague. The Druids used the semi-circular shape and charm of the horseshoe as a religious symbol, as seen in Stonehenge. In Rajputana, India, temples were constructed on the plan of the horseshoe wherein yoni, or female phallic symbol was worshipped. Windows and doors designed in the horseshoe or arch style of architecture also represent the phallic symbol. The Moors fashioned their mosques and temples with arches because they believed in the protective powers of the u-shaped or crescent-shaped symbol of good luck. Nowadays you can see door-knockers, floral designs, and other products shaped like a horseshoe, all symbolizing the good luck of the horseshoe used to bring that good luck to the owner of such an item. Whenever we see a horseshoe nailed over a doorway we instinctively know it is there standing guard to protect the occupant over the building. That occupant can be an animal or man. Any Horse sayings you know? ‘Odd on the neck, forelock makes evens’ – refers to plaiting I think it’s an old hunting saying that has it’s origins in the superstition that odd numbers are unlucky. ‘No foot, No horse’ – speaks for itself really. (Referring to white socks on a solid colour) ‘One try it, two buy it, three suspect it, four reject it’ – No idea where that came from. “God forbid that I should go to any heaven where there are no horses.” – enough said. Haha. “He who said he made a small fortune in the horse business probably started out with a large fortune!” – don’t we all know that? “When you’re young and you fall off a horse, you may break something. When you’re my age, you splatter.” – Roy Rodgers makes me smile. This is certainly a outstanding article. Thanks a ton for bothering to summarize all this out for folks. It really is a great help!